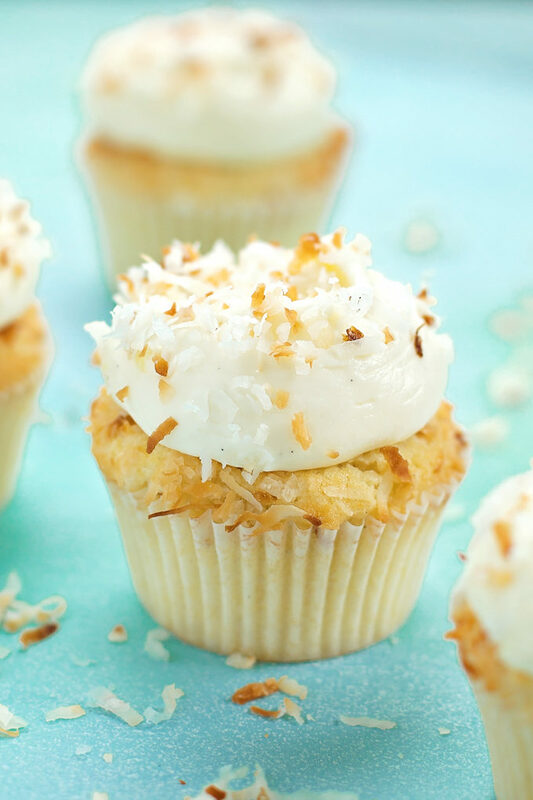 Soft and tender coconut cupcakes topped with a luscious pineapple cream cheese frosting. 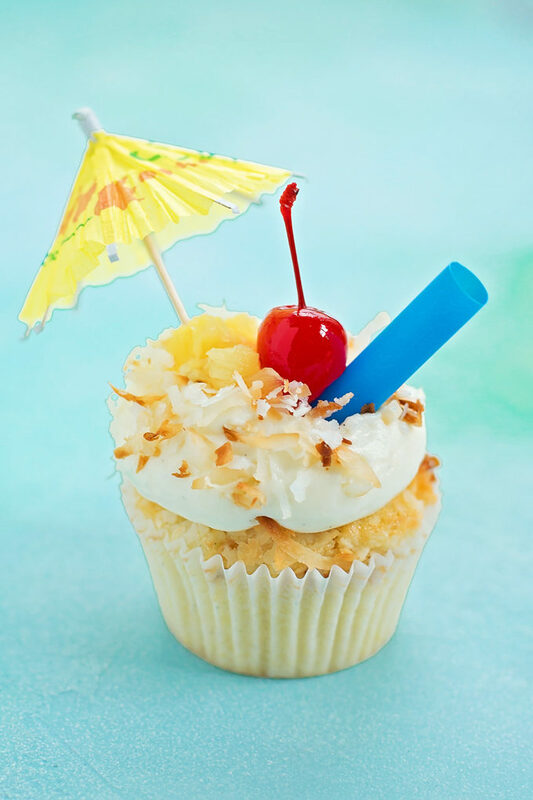 These tropical piña colada cupcakes are a sweet escape! How was your 4th? We spent most of it driving from Florida to Virginia, and then getting semi-settled into our new place. While we didn’t stay up for fireworks, we did see fireflies, and the kids absolutely loved them! I know I haven’t been super consistent lately. But with the husband gone for the next 3 months, and us moving, and a baby on the way, things are kind of chaotic. So bare with me, I will be posting more frequently once our internet gets set up (hello from Starbucks)! 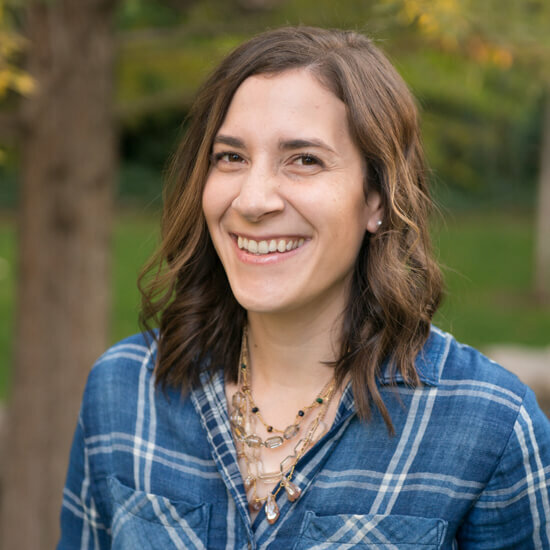 Today’s post is one I’ve been really excited to share with you guys. It’s one of my favorite summer combos baked into tender, flavorful cupcakes. This isn’t the first time piña colada cupcakes are making an appearance on the blog. 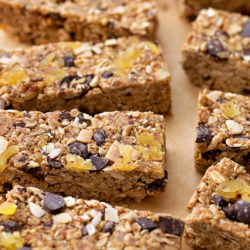 I posted this recipe a few years back and they were a huge hit with our family. I’m taking coconut and pineapple and separating them into two layers of deliciousness: coconut on bottom and pineapple on top! You’ll start by making super light and fluffy coconut cupcakes. 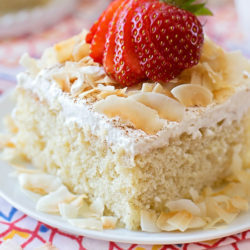 Coconut oil, coconut milk, coconut extract AND sweetened shredded coconut give these tender cakes their amazing flavor. As soon as they come out of the oven I’d suggest whipping up the pineapple frosting. Since it’s cream cheese based, you may want to refrigerate it for 30 minutes or so before piping it onto the cupcakes. It is a stiffer frosting, however, if you plan on using a tip with detail (like a star tip), you want it to be extra firm. I did not refrigerate mine since I used a large round piping tip and piped it into the center of the cupcake. 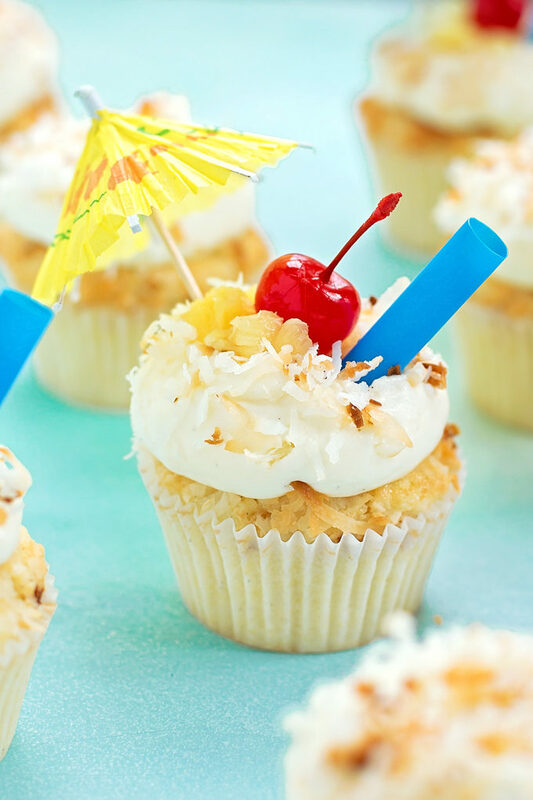 You can top these tropical cupcakes however you’d like. I went extra cutesy and added an umbrella, cherry and straw for decoration. That’s totally optional though. 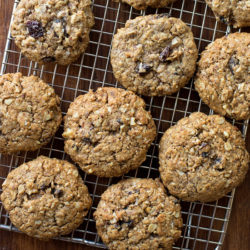 Just a simple sprinkle of toasted coconut is definitely enough! 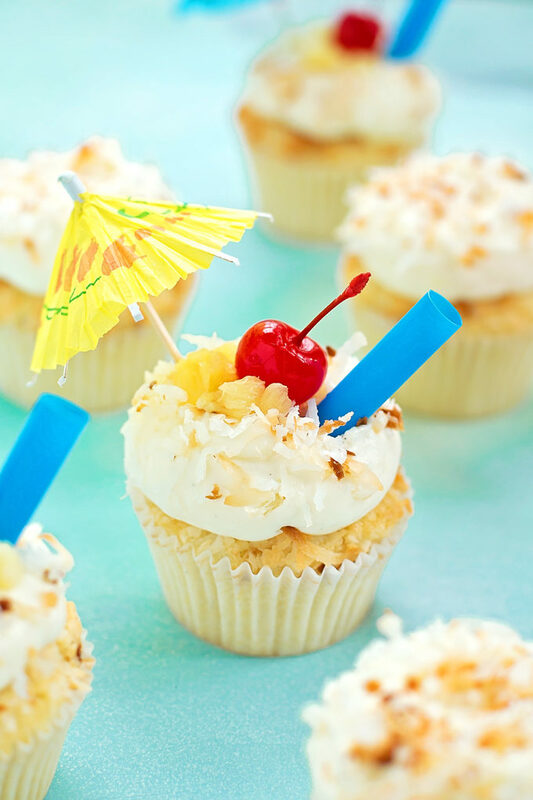 If you’re in the mood for something sweet and sunny, give these tropical piña colada cupcakes a try. 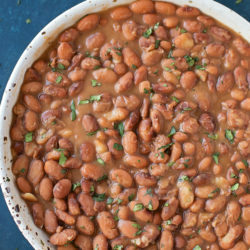 They taste amazing and are perfect for summer! Preheat the oven to 35o degrees. Line a standard size muffin pan with cupcake liners, and a second pan with 3 liners. Set aside. 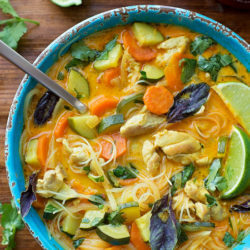 In the bowl of a stand mixer or a large mixing bowl with a hand mixer, beat the butter and coconut oil on medium-high speed until smooth, about 1 minute. Add the sugar and beat on high speed for 2-3 minutes or until pale. Add the egg whites (they do not need to be beaten separately), vanilla extract, and coconut extract, mix until combined. In a medium mixing bowl, whisk together the cake flour, baking powder, baking soda, and salt. 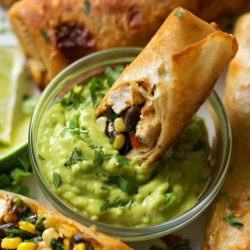 With mixing speed on low, alternate adding the dry ingredients along with the sour cream, coconut milk and 1/2 cup of shredded coconut. Mix just until incorporated. Using a #20 scoop (3.5 tablespoons) fill each cupcake liner with batter. Top with toasted coconut and gently press it into the batter. Place in the oven and bake for 18-22 minutes, or until a cake tester inserted in the center comes out clean. 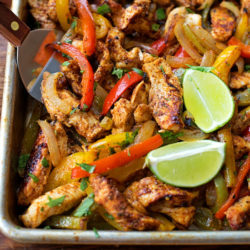 Remove from the oven and allow to cool in the pans for 5 minutes before transferring to a wire rack to cool completely. Meanwhile, to prepare the cream cheese frosting, in the bowl of a stand mixer or a large mixing bowl with a hand mixer, beat the butter along with the salt and vanilla until creamy, about 2 minute.With mixing speed on low gradually add the powdered sugar, beat until it forms a thick paste. Add the pineapple, pineapple juice and cream cheese, mix on the lowest speed possible for 1 minute, then STOP! 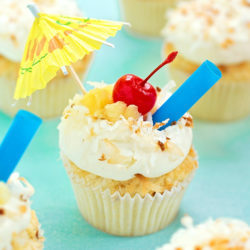 Pipe over the cooled cupcakes, then top with toasted coconut, crushed pineapple, maraschino cherries, umbrellas and straws, if desired. I moved last month as well, and I feel like we may never get settled. Holey moley, so stressful, isn’t it? These cupcakes look heavenly, and that frosting is calling my name. I bet it would be good on so many things. Gotta try it! hey girl- girl- these cupcakes look so yummy! Hope you have a great day! 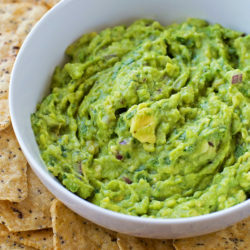 My little brother in law’s birthday is coming up, I’m going to try my hand at these! They look so good! 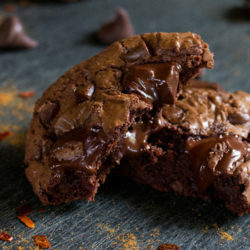 I made these today! They were so rich and moist. The frosting was super creamy too. Perfect treat for sunny day. Thanks Natalie! So happy to hear that they were a success! Thanks for stopping by Melissa!